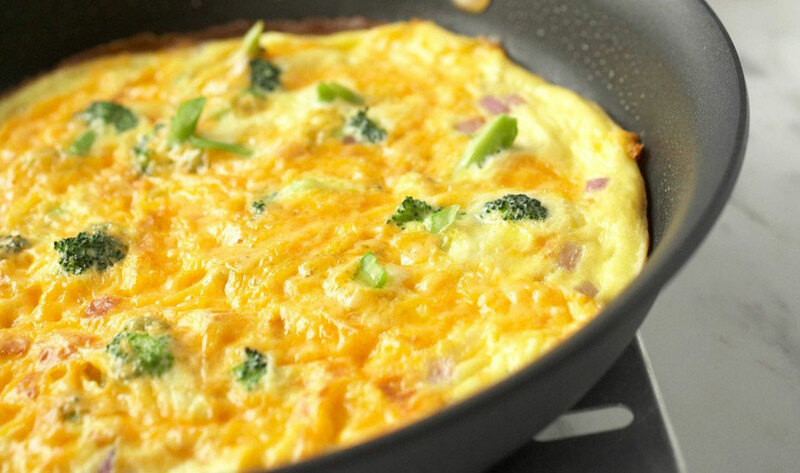 Heat butter in 6 to 8-inch nonstick omelet pan or skillet over medium heat until hot. Pour in egg mixture; cook over low to medium heat until eggs are almost set, 8 to 10 minutes. Remove frpom heat. Cover and let stand until eggs are completely set and no visible liquid egg remains, 5 to 10 minutes. Cut into wedges. This egg frittata recipe is perfect for brunch or a quick weeknight dinner. Fill with leftover cooked vegetables, potatoes or even rice. Broiler Method: Prepare frittata in a pan with an ovenproof handle. (To make handle ovenproof, wrap it completely in aluminum foil.) Cook on stovetop until eggs are almost set. Sprinkle with shredded cheese, bread crumbs or crushed chips. Broil about 6 inches from heat until eggs are completely set and no visible liquid egg remains and cheese is melted or topping is lightly browned.